Magpie Mine where 20 miners were accused of murder. Red Soil Mine, where 3 miners died, lies 100 yards East. Location SK 173-682, 4 km W of Bakewell. Disputes between Magpie and neighbouring Red Soil mine began about 1824 and continued for 10 years, arguing over who owned a seam of lead ore. The Barmote Court failed to solve the problem, and in 1833 three Red Soil miners died, apparently suffocated by smoke from Straw and oil lit by Magpie miners. Twenty Magpie miners were charged with murder, and 7 months later a Trial was held at Derby Assize to decide the matter. The Court sat for 26 hours over 2 days, 28 witnesses were called with the result that all the accused were aquitted. The complex proceedings are detailed in a booklet published about 1835. The transcriber found the witnesses' statements painted a vivid picture of the life of a lead miner, and a Cast List very useful. "June 7, 1857 George Jackson, Tideswell"
East part of Magpie ground (Fair Meer piece) 1. Red Soil Founder Shaft (climbing). Foundations of coe can be seen. 2. Maypitts Founder Shaft (site of). 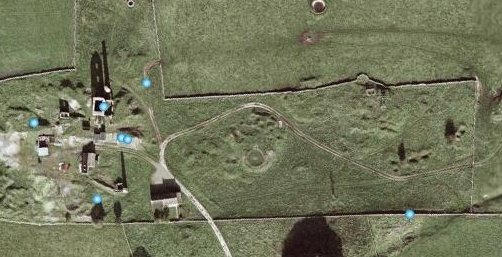 In this corner of the ground there are a number of slight shaft-hollows, also a small round hummock - grassed over, with harebells and heartsease once when I saw it - which could be a pile of stones over a shaft, but there is no proof of exact position. Horsteps Mine was in this corner. 3. There is no indication as to how far the Red Soil drawing (gin) shaft was from the Red Soil Founder Shaft, although it is stated that they were separate. Signs of gin-circles on these mounds are indeterminate but very probable. 6. 3rd, or Little Sump, a waggon gate at the bottom of this. The Red Soil drawing shaft came down in a straight drop to the wagon gate. 7. This line is on the 1820s plan. It was called Bole vein by Magpie, and Red Soil Vein by their opponents. 8. A gate from the bottom of the Red Soil Founder Shaft to the bottom of Maypitts Founder Shaft, and therefore to the top of the 1st sump. 14. Magpie coe and old climbing shaft (site of), believed to be Magpie Founder Shaft. From a crude plan, and from many descriptions in documents, all from Brooke Taylor documents. From "Magpie mine and its Tragedy" by Nellie Kirkham, published 1962. 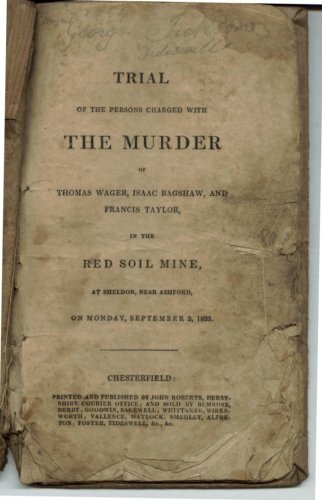 Mon 02 Sep 1833 3 miners found dead in Red Soil Mine. 17 miners committed to County Gaol. Wed 19 Mar 1834 Lent Assizes opens at Derby. Sat 22 Mar 1834 Trial of Magpie miners opens and sits for 11 hours the first day. 8 miners aquitted. 10 miners tried for murder. attempts were made by the jury to enter the Magpie Mine through the opening, and heavier penalties imposed. Matters were in this state when, on Saturday the 31 August, 1833, the workmen in the Red Soil Mine were much annoyed by smoke, which rendered it very difficult for them to continue long at work. On the Monday morning following (Sept 22nd, 1833) the Red Soil Miners assembled at the top of the shaft, and one of them entered the mine, and finding there was not so much smoke in it as there had been on the Saturday previous, told the men who were descending they might advance. Isaac BAGSHAW, of Sheldon, aged 40, who had a wife and three children; and Francis TAYLOR, of Bakewell, aged 22, who had a wife and one child. The bodies of BAGSHAW and TAYLOR were found jammed together in one of the shafts, their head hanging down and blood running from their mouths. There is every reason to believe that WAGER lost his life in attempting to save two of the men, who, in retreating, he found lying insensible in one of the levels. Some of the men passed him at the spot, when he exclaimed "For God's sake come back and assist me to get up these two poor fellows". He was found lying in the shaft a short distance from them, and about three yards below the two dead bodies, which he had found it impossible to pass. A post mortem examination of the bodies took place at the Devonshire Arms, Ashford, by Dr REID, Mr FARNSWORTH, and Mr WALTERS, of Bakewell - A highly respectable jury (Mr G LANCASTER, of Bakewell, foreman), chosen from the townships of Bakewell, Great Rowsley, Alport, and Over Haddon, assembled at the Devonshire Arms, Ashford, on Tuesday morning, to investigate the dreadful affair, before Mr MANDER, the coroner. The inquest sat again on Wednesday, and after a number of witnesses had been examined, it was adjourned until the Wednesday following, when a verdict of Wilful Murder was returned against twenty of the Magpie miners, and against two others as accessories before the fact. Seventeen of the miners were shortly afterwards committed to the County Gaol to take their trial at the Lent Assizes, the business of which commenced at Derby on Wednesday the 19th of March. This morning this important trial came on for investigation. The Grand Jury ignored the bill 1 against Richard SUTTON, Jonothan ROWLAND, Samuel TURNER, Abraham DOXEY, Benjamin MARSDEN, Thomas SKIDMORE, Thomas ASHMORE, and --- WALKER, as principals; and against William WYATT and John GREEN, as accessories before the fact. The whole of the prisoners now in custody were placed at the Bar, and pleaded not Guilty. The Jury having been sworn - Mr Serjeant GOULBURN stated that it was not his intention to offer any evidence on the coroner's inquisition, against those as to whom the Bill had been thrown out, and the Jury in respect of them would return a verdict of acquittal. - A verdict of Not Guilty was then taken in favour of Richard SUTTON, Jonathan ROWLAND, Samuel TURNER, Abraham BERESFORD,Abraham DOXEY, Benjamin MARSDEN, Thomas SKIDMORE, and Thomas ASHMORE, and they were ordered to be removed from the bar. George MALTBY, aged 37, George SUTTON, aged 23, Joseph BAKER, aged 26, James GOODWIN, aged 31, John BUNTING, aged 21, Thomas BAGSHAW, aged 24, William STONE, aged 21, Charles HARRISON, aged 21, Daniel HARRISON, aged 46, and Isaac GOODWIN, aged 27, were then put to the bar, charged with having feloniously, wilfully, and maliciously murdered Francis TAYLOR, Thomas BAGSHAW, and Thomas WAGER, at Ashford, on the 2nd of September last, by means of noxious and unwholesome drugs and poisons which impregnated the air where the deceased men were working. Mr Serjeant GOULBURN, with whom was working Mr WHITEHURST and Mr HUMPHREYS, appeared for the prosecution; and Mr BALGUY, Mr CLARKE, and Mr HILL, appeared for the prisoners. them out of their shaft, they then entered a part of the mine which was clearly in the occupation of the Red Soil miners, and put in it a mixture of straw, oil of coal, and sulphur, with a view, as we apprehend, to poison the air. They then pulled the waggon gate down to stop any communication, so that the noxious vapours were confined to the Red Soil Mine, so that when the miners came to their work, the noxious air and vapours immediately rendered many of them insensible, and caused the death of three; and the present enquiry would be whether or not the prisoners at the bar were aiding and abetting in the wrongful act which had been done. With respect to the evidence by which the learned Serjeant would seek to connect the prisoners with this calamitous event, his proofs would consist of many circumstances of suspicion occurring at the time, and would be made up by declarations of the prisoners themselves. He (Mr Serjeant GOULBURN) would not state what these declarations were at this time, for they might be deemed inadmissible in evidence, and therefore were he to dilate upon them there might possibly be raised a bias and a prejudice against the unfortunate men at the bar, or the persons might have forgot - at all events, it was better that they should come out of the mouths of the witnesses themselves - all that was desired on the present occasion was, that justice should be done. If the evidence was such as to leave no doubt, it would be their painful duty, but still it would be their duty, to pronounce them guilty; if there was room for a fair doubt, they would give them the benefit of that doubt, and acquit them. called an engine shaft. In the red Soil Mine the climbing shaft is separate from the engine shaft: the latter is perpendicular. Knows the waggon gait that was pulled in on the 3nd of September; it was part of the Red Soil Mine, and worked by the Red Soil Mine owners. The length of that gait was about sixty yards from the sump of that shaft to the end of that gait where it joined the mine. Cross-examined by Mr BALGUY - Was upon the Grand Jury. Never adjudged this waggon gait to belong to the Magpie Mine. Has been down the mine many times: saw no cross veins: only went as far as the bill given by the Red Soil miners directed me to go, and no further; and as far as witness went he saw no cross veins. Was in the mine on the 23rd of August, but not between that time and the 2nd of September; neither was he on that day. Did not see the miners at work on the 23rd of August; but the mines were in course of work. (A paper was here handed to the witness which he looked at.) Believes that in 1831 it was found that the proprietors of the Magpie Mine had a good title to a cross vein there. Went before the coroner, but not as a witness, but was in the room for a short time; attended every day. believes that none of the prisoners were permitted to be before the coroner while witnesses were being heard against them. Knows Mr WAKE, the attorney for the prisoners, and also that the coroner would not permit him to be in the room, though he did witness, who wanted to hear the evidence of the medical men. At first it was an open court, but afterwards a close court, was there when it was a close court. Witness attended at the request of the father of one of the deceased men, while a post mortem examination was proceeding. him until he had reached the end of the waggon shaft. There were some Red Soil miners at the end of the waggon gait close to the Magpie sump; they were guarding the possessions of the mine. Saw some of the prisoners there; MALTBY was one; he was one who opposed my going further. If witness was down as a juror, the cross vein witness saw, at any time, had nothing to do with the waggon gait. when he got a little better heard the men groaning and crying above him; witness was drawn up the engine shaft. On the Sunday morning about dinner time, between 12 and 1; saw four men let down into the Magpie Mine, two bags, and some straw; did not know the men. On the same day met two of the prisoners, John BUNTING and Richard SUTTON, in a field as I was going to the Red Soil Mine; it was after the bags had been let down. Witness said, " Now lads, how goest thee on?" BUNTING said, "Middling." Witness said, "Thou see'st thou hast not killed us all yet, we are pretty good devils that come from our side, we can stand it well." Further said, "Some of our chaps were down on Saturday, and heard you talking and blowing." One said, "Aye, aye, our physic's been hardly strong enough yet, you shall have it rather stronger in the morning." Does not know which one it was who said this. Cross-examined by Mr CLARKE - the little sump was open at one in the morning of Saturday; but only half way on. Believes the Magpie Miners thought we were working in their mine. Found no ashes at the hole on the Saturday as though there had been a fire there; will swear that for a month; did not go so far as the hole. When witness saw the straw taken down the mine, did not know what it was taken down for; it might be for smoking them, but thinking and being sure are two different things. Has seen William WILDGOOSE here, but there are two WILDGOOSEs. Heard the fan under the little sump at the far end of the waggon gait; the sump had been filled by our people with rubbish, which the magpie men had drawn out; did not say any thing before the Coroner about the little sump. sump was so ill that he was obliged to stop. On the Friday when in the waggon gait we heard a noise, it appeared to be the roar of a fan. remembers an alarm being given on the Monday morning; in consequence went down the mine, went to the bottom of the 24 fathom; saw William WOOD there; he was laying down on his belly; got him out to the top by strapping him to his shoulders; after he had taken out WOOD found others laying in the same state; witness went up and desired water to be flung down the engine shaft; witness then took out HEATHCOTE and the rest who were at the climbing shaft; witness then went 16 fathoms lower, where he found OLIVER, who was covered with dirt and blood, he desired witness to let him lie still, for it was nearly over with him; witness took him out, and returned and proceeded still lower, where he found two men laying dead, their heads down on the ledge, their legs being up, there was blood running from their mouths; they were then quite cold and stiff; then went three fathoms lower, and then found Thomas WAGER, also lying dead. Witness was too agitated to be able to notice what took place afterwards in the mine. Remembers at one on the Monday morning sitting near a wall at the mine head, when two of the prisoners Joseph BAKER and Daniel HARRISON, with their wives passed by: Hannah BAKER said to HARRISON that they would come to the mine in the morning, in order that they might see the performance; HARRISON said we'll have no women there. BAKER's wife said they would come and sit on the tale pole, which the horses draw by. 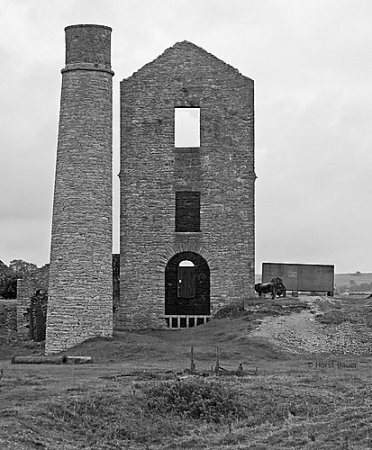 Cross-examined by Mr HILL - Must have expected from what he heard that there was to be a trial for the mastery in the mine; did not see any fire at the hole, but there were ashes near the waggon gait; there is no regular top to the engine shaft, but there is one to the climbing shaft. the dispute, I don't wish to make it any bigger," SLACK said, "I'll make it as big as I like, and be through before six in the morning," he then took up a mallet and began to bore a hole, into which, when he had bored a sufficient depth, he put powder, and began to stop it up; he pulled the needle out, and put straw in the hole; that is the way we blast a rock; he then set a lighted match to it, and SLACK ordered us to shift; there were many other men behind him, who together with SLACK got out of the way. Witness said he would not shift, he was on his duty; he put his head and shoulders through the hole to take the match from the straw, but could not reach it; drawing himself out again, by accident with the candle, he set has sleeve on fire, which sleeve fired some straw, which communicated with the powder; the rock was partly blown down, but no person injured. We lay still for some time, but afterwards witness made water on the straw and put it out. Coming up the waggon gait, witness and his party, were stopped by a smoke; went to the little sump, the smoke was coming up it; heard the noise of a fan; it appeared to come from a gait in the Magpie possession; when witness heard the noise of the fan, the smoke appeared to come stronger. Went with SMITH into the mine on Monday to assist in getting the men out; found John OLIVER; he was in the middle of the 20 fathom sump, he could not speak, but only moan. SMITH gave witness hold of his clothes to pull him up by; tried to get him out, but could not succeed, we were obliged to leave him, the sulphur was so bad we could not keep our legs; saw TAYLOR and BAGSHAW, they were dead. Went to the top of 20 fathom sump, but could not get any farther, being so perfectly exhausted with the sulphur; the smell appeared to come from oil of coal; the day before, Sunday, saw Richard SUTTON. straw; will swear it was by accident. Has never said he had left the fire lighted two hours, and had burnt the Magpie men out. Had no weapons, neither himself nor the other men that he knows of. There's no smoke in the mine till the straw was fired. It was between nine and ten that witnesses went down the mine on the Monday morning; was up all Sunday night watching; did not go down the mine on Sunday, was watching above ground. Don't know that any body went down the mine on Sunday night; it was not likely they should when there was smoke in the mine. Will swear he does not know whether any one went down the mine on Sunday. William WILDGOOSE examined by Mr HUMPHREYS - Went down the mine on Saturday; there was smoke in it then. Was in the mine on Monday on Monday morning; MOTTRAM had gone down before him; there was not so much smoke then as on the Saturday; it was clearer in the 16 fathom shaft than it was in the upper; told it to the men whom witness saw coming into the mine. On that they went forward; it was about quarter of an hour from that time when two men came up for assistance, and witness, who had heard them come up to the top, went down again, and found a smoke and a vapour; the smoke different to that which had been in the mine on Saturday. Can't describe the vapour; felt very little of it till he was nearly ready to tumble over. Cross-examined by Mr CLARKE - Felt no inconvenience the first time of going down on Saturday. James WILDGOOSE is my son; he is not here; neither is MOTTRAM; they both went down the mine on the Monday: his son was very ill; most of the men about, might know that MOTTRAM and witness's son were ill through going into the mine; the engine shaft was not stopped at the time witness went down; had not stopped the gait between climbing shaft and the engine shaft; saw HOUSELY on the Saturday morning; he had his mining clothes on; the rough coat worn by miners outside of their other clothing is called a kitle 2, they are generally made of rough cloth. waggon gait; then went to a hole about four fathoms from the waggon gait; went up to the hole; saw Joseph BAKER, one of the prisoners; HARRISON was with him there; were boring a hole for a shot; BAKER said he was going to let it off. BAKER first called out, "MALTBY, haven't I orders to fire this shot?" A voice answered "Yes". WOOD said "If you kill or lame either of us, there will be a spot for you at Derby". He said, "I care neither for you, or Derby". He did fire it off, but witness received no injury. Cross-examined by Mr HILL - Was good friends with them; had exchanged bread and cheese with them through the hole; it was before they fired the shot. WOOD was not hurt to witness's knowledge. William WOOD, examined by Mr WHITEHURST - Was in the mine with the last witness on the Friday night, was tenting there. Joseph BAKER, MALTBY, and HARRISON were tenting on the other side. Is sure MALTBY was one of them. Went down on the Monday morning into the mine; was struck by the shot in the breast; heard BAKER ask MALTBY if he must fire the shot. MALTBY said "Yes, fire on; never mind the loss of a man or two". Found TAYLOR in the mine on Monday; he wished to pass witness; witness said "Come along, I'll get out of your way as soon as I can". He then went down to the bottom of the 60 fathom; saw the sulphur, it appeared like a blue mist; had candles at that time; they went out when about 7 fathom from the 60 fathom; the top of the climbing shaft was shut at that time. Witness went to the top of the 60 fathom level; the climbing shaft was then open. He had no use in any of his limbs at that time. Cross examined by Mr BALGUY - Will swear the blasting was done to injure them, and not to get rid of the rock. Always use powder when they can, it is the easiest mode of getting rid of the rock. They told witness to get out of the way; but witness thought then that there was as much danger in going as in staying: was wounded by the firing of the shot in the breast; it injured him a little. Cross-examined by Mr BALGUY - Was at work in the Red Soil Mine. No smoke there on Friday; there was on Saturday. Henry KNOWLES told witness to go and get a fork, and if he could stand the smoke he was to fire away; he was to fire with straw; he said there was plenty of straw down there; it was to smoke the Magpie people away. James HEATHCOTE, Francis TAYLOR, Matthew BROCKLEHURST, and Samuel ASHTON went down with witness: in going down they met Samuel HOUSLEY and Thomas SMITH; HOUSLEY said he had lighted a fire for two hours, and had nearly driven out the Magpie men. He said the smoke worked round, came up the waggon gait, and it caused him to leave it. HOUSLEY had a milled flannel jacket and trousers on, with a handkerchief tied round his neck. Witness went round to the waggon gait to attempt to get a fork, but could not on account of the smoke. Was sent down by KNOWLES on the Sunday afternoon with others; went to see whether they could go far, but they could not for smoke. Francis TAYLOR was with him. Was tenting on Sunday night with 24 others; some went down in the night; they said they could not get farther than the 20 fathom sump on account of the smoke. KNOWLES came on the Monday morning, and remained until after the accident happened. MOTTRAM and WILDGOOSE went down on the Monday before TAYLOR and BAGSHAW. KNOWLES was on the outside when MOTTRAM and WILDGOOSE came up; they were both very ill. Heard MOTTRAM say it was not fit for any body to go down. Saw MOTTRAM lying on the ground; offered to lift him up. KNOWLES said, "Let him alone, he's a damned hypocrite." Some of the men demurred to go down; KNOWLES said if they did not they should do no work there. Witness demurred to go down. Witness told him he would not go down himself, as the mine was not in a fit state. KNOWLES said he must keep possession of the mine at all hazards. The foundry and climbing shafts were closed up; KNOWLES ordered it to be done in order to drive the smoke back on the Magpie workmen. WILDGOOSE go down. The foundry shaft was sodded on the Saturday morning. Henry KNOWLES, examined by Serjeant GOULBURN - Is overseer of the Red Soil Mine; was not there on Friday; was first at the mine between four and five on the Saturday morning. When he arrived he found the foundry and climber's shafts as full of smoke as a chimney on fire; had never given any directions to his men to smoke the Magpie men; is sure up to that time he had given no instructions to smoke the mine. Witness took two men with him to Bakewell, to advise with Mr GAUNTLY, and then came back to the mine about noon on the Saturday morning. The shafts were open at the top and smoke coming out; they were open by my order; they were full of smoke, and it did not abate much till the Monday morning, about four o'clock. Several went down on Sunday night, at times, to see the state of the mine, as far as they could go; never went down himself. Knows SMITH; he was only in my occasional employ, and was to tent and to watch on the present occasion, but never worked in the mine; he was employed about fourteen days altogether. Gave him no directions to go into the mine; did not direct him to get a pitch fork and fire away: nothing of the kind. The further examination of this witness was objected to on the part of the prisoners by Mr BALGUY, on the ground that the prosecutor has no right to impeach the testimony of his own witness, SMITH, and his Lordship proceeded to the other court in order to consult the Chief Justice, and on his return he decided that the evidence might be proceeded in. This was not a case where the prosecutors sought to impeach the credit of their witness as to any fact which they themselves had brought out; but what they sought to do was to call in question that new matter which had been brought out by cross-examination. men, or any thing tending or leading that way: remembers MOTTRAM lying on the ground: does remember saying "Let him alone, he's a damned hypocrite": they told me they were crying murder on all hands, and witness thought they were not doing all they might to get the men out. Cross-examined by Mr BALGUY - BAGSHAW was in the mine. Don't know that MOTTRAM went down, but that WILDGOOSE did. MOTTRAM went down after WILDGOOSE went down. Will swear that William WILDGOOSE went down by himself. Will swear it was past four before witness arrived at the mine: remained above ground all the time till Monday night: has a son; he was there: will swear he went down into the mine, but not as to the time; it was while witness was at Manchester; does not think he went down at the time in question: witness was at the mine all Sunday night, and till dark on Monday night: was aware on Sunday night that the mine was unfit to be entered; it was at first open: a man came up and said you must keep it shut; witness then shut the place, the man saying "You will turn their smoke upon them". Cannot say whether more than one party went down on Sunday night. Was not before the Coroner as a witness, but was taking an active part. Re-examined by Serjeant GOULBURN - Had closed the top of the shaft some hours before BAGSHAW went down. The Magpie men came out of their shaft after midnight on Sunday. When TAYLOR, BAGSHAW, and WAGER went down there was no appearance of smoke or any thing to endanger life. same that BERESFORD took down; HARRISON was looking towards it, and called it oil of coal. Saw William STONE there, remembers seeing Joseph BAKER put some straw down the shaft, it was at five o'clock on the Monday morning; hear BAKER say in WYATT's room "they would have the rope it would do to draw with". Cross-examined by Mr CLARKE - Had been out late, and thinking his master would be angry, staid out all night; should not think the jug was an ale jug, when they carried oil of coal in it; had known BAKER before that night. Daniel WOODHOUSE examined by Serjeant GOULBURN - Knows the prisoner George MALTBY; remembers seeing him on Monday after this accident; it was about one or two. Witness is not a Red Soil miner, but works at the Grand Junction Mine. MALTBY said he had come for some men, the head Bar-master had sent him; he was asked what was the matter; he said there was something amiss at the Red Soil Mine, that three men were said to to be dead, but he seemed to hope that it was not so. Witness asked him whether they had been smoking them; he clasped his hands together and said "I wish we had never smoked". Witness said, "perhaps its too late". George BROCKLEHURST examined by Mr HUMPHREYS - Remembers seeing some of the prisoners go into the Magpie Mine on Monday morning; saw Joseph BAKER, George SUTTON, and Richard SUTTON. John BROCKLEHURST examined by Serjeant GOULBURN - Knows the prisoners, James and Isaac GOODWIN; saw James GOODWIN come out of the mine about twelve at noon on Sunday, with two others he did not know; they went to SLACK's house, which is just below the mine; saw them come back in half an hour; their clothes were changed, and they had two small bags with them, which would hold about a strike of meal; a bottle, and some straw. When at the mine, they first let the bags and and bottle down by the engine shaft of the Magpie, and then they threw the straw down afterwards. hillocks; he said, speaking to the Red Soil men, "they (the Magpie men) would smother them all by nine o'clock on Monday morning. James HEATHCOTE examined by Serjeant GOULBURN - Saw BUNTING and SLACK, with other persons, put down into the Magpie Mine, two bags, and a bottle. Heard John BUNTING say he would go down the Magpie shaft, mend the fire, and make it double strong for us. By the JUDGE - Never use any straw, unless a small quantity to let a shot off. Richard GLOSSOP examined by Mr HUMPHREYS - Had come conversation with John BUNTING on Sunday: he called TURNER and witness two devils, because they could stand smoke: he also said that two men had gone down the Magpie Mine who would give us a fizzer. Knows the prisoner, Charles HARRISON, who had something under his smock, he said, when asked about it, "It did not matter, it was not brimstone, but they should smell the devil's dung." Anthony BROCKLEHURST examined by Serjeant GOULBURN - Remembers John BUNTING coming to the Red Soil Mine in company with two other men; he said a great smoke came up the Maypit shaft, which adjoins the Magpie. BUNTING said it would give more smoke before morning, and that they's give us some pills before morning that we should not like, and that he'd give us a smell of the devil's dung before morning. Knows Charles HARRISON, saw him go by my father's house on the Saturday, with a jug; he went to his uncle's, Charles HARRISON, and afterwards, on the same day, saw him go to the Magpie Mine. day the Coroner sat; STONE came to witness, and said he had heard witness was going to say something again him, If I did, he said he would either break my neck off or pull it out. John Alexander CARRINGTON - Lives at Bakewell; remembers Charles HARRISON the younger coming to his shop to purchase some oil of coal, or gas tar; sold him two quarts, which he took away in a stone bottle; this was on the Friday or Saturday. Thomas SMITH the younger. Knows Daniel HARRISON. Remembers on the Monday going down the Magpie Mine; went down to him to tell him to put the fire out; it was about 11 o'clock. Witness said, "You must put the fire out, for you have killed all our men". He said, "Damn you, we'll give you fire enough now". Joseph HEATHCOTE. Is a farmer at Taddington. Was at his grandfather's on the first of September. Remembers Thomas BAGSHAW coming in, he said, there wood be blood for supper and that we shall give them a brimstone pill, and if we would go there next morning we should see them come out like dead bullocks. Cross-examined by Mr CLARKE. Has always considered BAGSHAW a man of weak understanding. Dr REID examined by Mr HUMPHREYS - Is practising at Bakewell as a surgeon and physician. Was sent for on Monday the 2nd of September, to the Red Soil Mine. Saw the men all brought out but two, from the mine; they were all affected with difficulty of breathing, pain in the head, and loss of muscular power: a bad and noxious air would cause this. The bodies of the deceased were opened. Believes suffocation to have been the cause of death of Isaac BAGSHAW. If burned in large quantities, oil of coal would cause death; brimstone would also produce it. Should think the burning of oil of coal and straw in so confined a place as the mine, would produce death. Is of opinion, that had the shafts been kept open, the lives of the men would have been spared. By the JUDGE - Is of opinion the burning of oil of coal and tar with straw, would have produced the symptoms displayed. in BAGSHAW's case but what might be produced by suffocation of an ordinary kind. In the other men the appearance of suffocation was less marked; there was more appearance of apoplexy; noxious air, very strong, in a confined place, would have a tendency to produce apoplexy. From what he saw of the symptoms, there was little or no sulphur burnt in the mine. Charcoal would be more pernicious than the gas tar. He could not go into a place filled with the smoke of gas tar without at once perceiving it. It is possible the other two might have come to their death through the bruises they received. He saw no appearance of a blow on BAGSHAW; sometimes a small blow on the head will cause death. Re-examine by Mr HUMPHREYS - In his opinion BAGSHAW's death was occasioned by suffocation. Cross-examined by Mr CLARKE - He does not know whether if the shafts had been opened the men would have lived, but he was of the opinion that closing the shafts contributed to the deadly effects of the vapour. James WALTERS examined by Serjeant GOULBURN. Is a surgeon at Bakewell. Saw the body of Isaac BAGSHAW on the Wednesday, and was present when it was opened; there was no particular appearance about the brain, save its being a very healthy one, the brain being firm and a beautiful specimen. Looked at the chest, found the lungs completely gorged and distended with blood. The heart was in a state of contraction, and that death was caused by suffocation, witness has not the least doubt. Oil of coal, such as described, burnt with straw, would not alone be sufficient to cause the death of the deceased, and believes something else must have been used, such as sulphur, because it is irrespirable, and would produce the appearances found on the lungs. Cross-examined by Mr HILL - Believes from appearances that the suffocation has been instantaneous. His lordship having taken his seat on the bench, and the names of the jurors being called over - Mr CLARKE, on the part of the prisoners, applied for the acquittal of those persons at the bar against whom the learned counsel themselves were unable to say that anything like a case had been made out. His Lordship, with the assistance of the counsel on each side, then went through the evidence as far as it had reference to these persons whose acquittal was now demanded; and his Lordship having carefully examined the same, directed the jury to return a verdict of acquittal in favour of George SUTTON, James GOODWIN, Charles HARRISON, Daniel HARRISON, and Isaac GOODWIN. before the coroner, which were thereby suffered to be circulated throughout all the newspapers in the country, accompanied with the grossest falsehoods and aggravations. They ascribed the death of the deceased partly to accident, partly to their own rashness in going down the mine when they knew, or ought to have known, that it was full of foul air but mainly to the improper directions and orders of KNOWLES, the superintendent, as it was well known, they said, that the Red Soil miners had by his orders made a fire of straw several times at the bottom of their mine. But whether that fire had been made by accident or design, the prisoners considered themselves justified in pulling down the waggon gait, and thereby preventing the smoke from entering the Magpie Mine. In consequence of that, and of the covers being kept on the tops of the Red Soil shafts by KNOWLES's orders, the smoke was confined in the Red Soil Mine for two days; notwithstanding which KNOWLES had persuaded his men to descend on Monday morning, after the two men who had just made the experiment returned faint from having gone down half way. If due caution had been used, and time given for the foul air to pass away, with proper ventilation, &c, the unfortunate occurrence would never have happened. They denied solemnly having ever intended to do the Red Soil men any injury; and expressed their deep regret at the fatal event which had led to the present inquiry. John TURNER, examined by Mr CLARKE - Lives with his father, about half a mile from the mines; worked at the mines. George MALTBY lodged in his father's house along with witness, who left home at seven in the morning of Saturday, to go to the mine. Slept in the room with MALTBY, and left him in bed at seven on the Saturday; we had come home at midnight on the Friday. Saw MALTBY at the top of the mine some time before noon on the Saturday; MALTBY had not been in the mine up to the time of witness's leaving it; he left him at the top of the mine. mine to call them up, that was about ten. George MALTBY, George SUTTON, Charles HARRISON, Richard SUTTON, and BAKER, came up, BAGSHAWE was already up, and had been so about an hour, as also BUNTING and STONE; saw Daniel HARRISON at the top, and James GOODWIN; witness went down about 40 fathoms but did not see any smoke; was not down the mine on Sunday; between 8 and 10 on the Saturday morning witness was filling the barrows with the ore which was to be drawn up; did not go to see the straw lighted at the waggon gait. Will swear he did not know there was a fire made, or burning on the Monday morning; he was ten yards from the sump top; did not hear them pull in the waggon gait. Was doing nothing else on the Monday, than looking about him; there was no stuff got that morning; did not go into the mine after this transaction for about a week; when the prisoners came up the mine, they did not say what they had been doing; will swear it; they went to the engine where they staid about half an hour; they were talking about summat, but don't recollect what that summat was; will swear they never mentioned in his hearing what they had done in the mine. Nathaniel ANDREWS, examined by Mr HILL - Was in the Magpie Mine, with MALTBY, at four o'clock, on Friday afternoon, and he was there till twelve, working in the lower sump, it was about six fathoms lower than the holing was; he had nothing to do with firing the shot, went home to TURNER's soon after one o'clock; went on again at six o'clock; left MALTBY in bed; staid down on Saturday morning from six to twelve; found MALTBY on the top; he did not go down the mine; they went together nearly seven miles, he lives at different village from witness. Returned to the mine on Monday about half-past eight; MALTBY came about nine, and they proceeded into the mine together; saw no fire and but little smoke, was ordered up in about an hour. Before witness was there the waggon gait had been pulled in; there was no fire, and if there had been, the smoke could not have got into the Red Soil Mine through the waggon gait,and if they had made a fire the Magpie men would have been smoked. been lit on the Red Soil side, and the waggon gait then pulled in, the smoke might have gone up the Red Soil side. MALTBY had nothing to do with firing the shot. Found on Saturday morning the hole had been enlarged by the drift of the smoke through it. Was in the mine on Monday; saw one of the dead men; the man witness saw lying there was the first brought up; never saw the other two. Henry SHAW examined by Mr HILL - Remembers the accident at the Red Soil mine; was up at six, and staid in the street about an hour. About three quarters of an hour after six saw MALTBY, who went in the direction of the mine. Cross examined by Mr WHITEHURST - Was a miner, belonging to the water Mine, which is partly owned by Mr WHYATT, as is also the Magpie. Is a farmer now of six acres, and sometimes a labourer. a conversation with Joshua KNOWLES at the Grand Jury at Ashford; it was not pointed out precisely to witness where the unfortunate men were found. Cross examined by Mr HUMPHREYS - Witness decided for the Magpie owners, but the 19 thought it belonged to the Red Soil. The last time witness went down before the accident, the men were tenting, that was on the 23rd of August, at the bottom of the sump, each on their own side: there were some rough stones, too rough for the men to sit down upon, and ashes were found against these stones: when witness differed from the 19 other jurymen, he also resisted the warrant that the Bar master came to put in force: there was a ledge projecting over the place where the witness saw the stones and ashes, and was not a likely place for the men to sit upon. Thomas HILL examined by Mr HILL - Was one of the Grand Jury that went into the mine in March, 1832, when they found that the Waggon-gait belonged to the Magpie: they were 24 in number: it was a joint affair of the two mine owners: they might, if they had chosen to have disputed that finding, have done it in the regular course in the Barmote: sometimes the owners of a mine will take a Jury down at their own expense, but even then, it is not always the case that they give a verdict for one side in particular. Cross examined by Mr WHITEHURST - Went down the founders' shaft in 1832, to the 15 fathom, and then to the 20 fathom sump lower, then a few fathoms still lower, to a little sump; there was then no waggon gait, but a road. Does not think Mr WHITEHURST understands mining. A Grand Jury was down the mine last summer; did not go down the mine in October, 1832; was on a Grand Jury in October last, but did not confirm the finding of the August inquest. Re-examined by Mr HILL - They had a bill to examine the hole making the communication. It is not settled yet in whom the right possession of the wagon gait is. No proceedings have yet been taken in the Barmoot Court, to call into dispute the finding of the Grand Jury of 1832.
residing at Derby; has practised in that town for several years. Has attended the court during the whole of the prosecution, and in particular has attended to the medical evidence. Has not heard any evidence to prove that any thing has been used in the mine beside straw, oil of coal, and coal tar; but is of opinion that nothing else was used. Has a confident opinion that sulphur was not used; there is nothing more injurious to life by the combustion of coal tar, than in common coal, but it is more unpleasant. Is most decidedly of opinion that sulphur was not used: without doubt substances might have burnt more destructive to life than coal tar, and yet not have given intimation of danger so soon as coal and coal tar; and they are of such common use that even the most common people were aware of them. Has heard the account of the smoke being seen coming from the mine, and at any rate after nine o'clock no smoke could have passed into the Red Soil Mine. Finding there was little smoke at four in the morning, should conclude from that circumstance the fire was going out. Is of opinion if the shafts had been open shortly before the miners went down, no accident would have occurred, the confining the shafts was bad; is of opinion that if they had not been shut, no deaths would have occurred. "Suppose two persons going down into a mine should see a blue mist, and both of them feel the effects of it, and one should say to the other, 'retreat or we shall both perish'; and the other should answer, 'I am killed already', and fall down dead, and the other live; should you attribute his death to suffocation?" the symptoms they would have had from breathing sulphurous air. If free ventilation had been permitted, and the top of the mine uncovered, in a very short time all danger would have been removed. The man who fell, he should suppose, fell either from the effects of the air, or confusion and fright. Supposing he fell from fright, he could not tell whether he died from concussion or suffocation: but thinks if he died from suffocation the brain would have been more gorged. Re-examined by Mr CLARKE - The most decisive reason why sulphur was not used was, that those of the men who came out had not any of the symptoms which they would have had if sulphur had been breathed. Is most decidedly of opinion that had free ventilation been allowed, and the shaft left unclosed, in a few minutes the whole of the mine would have been cleared, and death would not have ensued. Mr HUMPHREYS - Supposing him to have slipped down, witness can't say whether concussion killed the deceased, or the fumes that he inhaled. By the JUDGE - Supposing the Jury to be satisfied that the deceased died from concussion, then you admit the indictment in that case is not sustainable. By a Juryman - My Lord, I believe BAGSHAW was found lying on his face. By the Jury, to Mr FOX - Is it necessary to produce concussion, that the individual falling should do do in any particular position. Mr FOX - No, violent shaking of any kind will produce it. If I were to take a fish and throw it on the floor it would die instantly; that would be by discussion, and you may have instances of this kind. August, and continued the whole of Saturday and Sunday, but they were not so bad as to prevent the men from going up and down. On Monday morning, the smoke had given way, and the men thought thy might safely venture down, but soon after they had so done an alarm was given, a great number of the men were brought out insensible, and three were dead. A coroner's inquisition sat, and a verdict of wilful murder was returned, and that question was the subject of the present inquiry. The first point for the Jury to consider was, whether the persons who died, and in particular BAGSHAWE, died from what had been done in the mine; they would also consider whether if that were so, the prisoners had anything to do with it, and after all, whether the deceased might not have died from concussion, and if so, they would return a verdict of not guilty, as in that case the indictment would not be supported as it then stood. With respect to the charge of murder, his Lordship gave it as his opinion that they might safely put that question from them, and he then proceeded to show what would constitute the crime of manslaughter, which did not require malice, but such a carelessness of the safety of others, as to cause death, was quite sufficient to establish the commission of that crime. His Lordship then read the whole of the material part of the evidence over, together with the defence, as put in by the prisoners, observing upon each point. There was also great difficulty in fixing crime upon any of them (as it regarded MALTBY, he did not think there was any proof), as the mere circumstance of their being in the mine, was no evidence that they were cognizant of, or participated in the proceedings that occasioned death. The Jury would take the whole case into their consideration, and return a verdict accordingly. The Jury begged to retire, but came into court in ten minutes, finding all the prisoners Not Guilty. Mr WHITEHURST observed that there were two other indictments against the prisoners, but after the verdict of the Jury he should not deem himself justified in offering any evidence upon them. at eight on the Monday morning and did not finally conclude, till half past six, the same evening. Attorneys, for the prosecution, Mr MILNES, of Matlock; for the defence, Messrs BRITTLEBANK, of Winster, and Mr WAKE, of Sheffield. 1. A grand jury, a type of jury now confined almost exclusively to some jurisdictions in the United States, determines whether there is enough evidence for a criminal trial to go forward. Grand juries carry out this duty by examining evidence presented to them by a prosecutor and issuing indictments, or by investigating alleged crimes and issuing presentments. A grand jury is traditionally larger than and distinguishable from the petit jury used during a trial, with at least 12 jurors. 2. Good description of a miner's "kitle"
Thomas Wager son of Sampson Wager of Great Longstone born 1791 married Elizabeth Young 13th September 1813 at Bakewell. Thomas Wager died September 2nd 1833 killed at Red Soil mine at Sheldon..His wife died in 1839 his son Sampson died aged 76 years in 1894 at Bakewell . Another member of the Wager family of Great Longstone was Jasper Wager born 1829 who attended The Study School Bonsall in 1840 along with William Bemrose of Derby who married Margaret Romano Simpson of Spondon as his first wife and as his 2nd wife Lilian Cummings of The Isle of Man William Bemrose founded Wm Bemrose Publishers and Master Printers of Derby and Spondon his father William Bemrose having had a Stationers at Matlock Bath and one time associate of Jonathan Coates Printer of Wirksworth whose daughter Mary married my 4XUncle William Hawley..
My father in law deceased worked for Wm Bemrose at their Spondon works in the 1970s, as I did for a time...My father in law also Father of the Chapel S.O.G.A.T. Another of the Wager family was Jasper Wager of Wirksworth Gent born at Great Longstone in 1781 son of William (born Great Longstone) and Elizabeth Wager nee Hill married at Dronfield in 1776.. Jasper Wager married Elizabeth Longsdon of Great Longstone 3rd August 1800. The Longsdon's being a family of some wealth. Their daughter Catherine Wager married Samuel Hall son of my 5XUncle and Aunt Stephen and Ruth Hall nee Henstock Ruth sister to my 4X Grandmother Mary Henstock of Slaley Hall who married William Hawley..(Slaley Hall about half a mile from The Study). All this Wager family are buried in Great Longstone Church Yard...Stephen Hall's first wife was Mary Taylor of Lea Hall Farm Bradbourne in the distant past owned by the Buxton family and The Dale's .. Lea Hall Cottage Farm today on the same land is worked by the nephew of friends of ours.. Transcribed, compiled, formatted, hyperlinked, encoded, and copyright © 2008, All Rights Reserved.